Implementation of the monetary policy stance, signaled through announcement of the Policy (target) Rate, entails managing the day-to-day liquidity in the money market with the objective to keep the short-term interest rates stable and aligned with the Policy (target) Rate. Specifically, as an operational target SBP aims at maintaining the weekly weighted average overnight repo rate close to the Policy (target) Rate . To achieve this operational target, SBP primarily uses OMOs to manage liquidity in the money market in a manner that there are no unwarranted pressures that diverges the weighted average overnight repo rate from the Policy (target) Rate. In case there is an upward pressure on the repo rate, due to shortage of liquidity in the system, SBP injects rupee liquidity in the system by purchasing government securities from banks with the agreement of selling the same on a transaction maturity date – the transaction generally termed as OMO injection by SBP. On the contrary, if there is excess liquidity available with the banks, putting downward pressure on the overnight repo rate, SBP mops up this surplus liquidity by selling government securities to banks usually with the agreement to purchase the same on the transaction maturity date. This transaction is generally named as OMO mop-up by SBP. If required, SBP also conducts foreign exchange swaps in the interbank to impact the market liquidity. Infrequently, SBP also changes the reserve requirements in case the liquidity shortfall or excess is expected to stay for a longer period of time. 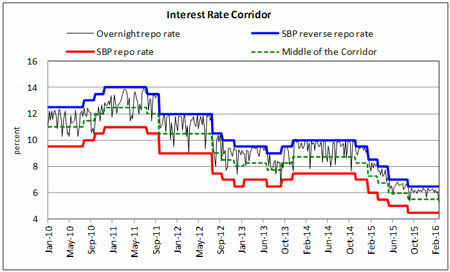 At the time of introducing the explicit interest rate corridor in August, 2009, the width of the corridor was set at 300 bps. It remained unchanged at this level until February, 2013 when it was narrowed to 250 bps. The width has been further narrowed to 200 bps in May 2015 (see Figure). The lower reliance of banks on SBP and limited volatility in the overnight rate is desirable to ensure smooth transmission of monetary policy signals to other market interest rates. Excessive volatility in the overnight rate may distort the term structure of interest rates by creating disconnect between short and long term rates. Moreover, it can also discourage the development of financial market instruments (as most of them rely on well developed yield curve).